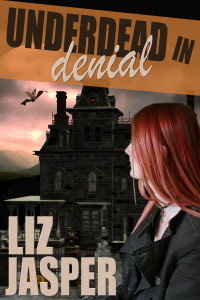 Underdead and Underdead In Denial re-releasing in ebook and in print! Last December, my publisher changed their focus away from mainstream fiction. I got the rights back to my novels just as the self-publishing world took off. The re-pub process has taken a bit longer than I’d anticipated. And I have to admit I needed a shove from one of my author buddies to go down this path. And a few long phone calls with another author friend who had gotten the rights back to his backlists. (He’s now a bestseller! He reports he doesn’t have groupies–bummer–but that he did have a woman come up and kiss him at Bouchercon. Yes, it’s those moments that sustain writers, even if it didn’t happen to them (and in their head they change “women” to “hunky guy”. Though I’m holding out for groupies.) More phone calls to other authors to see if they had a read on the market. Hard to believe at this point that all this back and forth was needed, but we were trying to figure it out as we went. The book market has changed tremendously in 2011. * Moved my website here and completely overhauled it. It took 8 calls to yahoo and many discussions with my genius social marketing friend about why I kept loosing my email. But it eventually got done. By me trying different things and finally discovering what worked. * Eaten chocolate. Lots of it. Got the cat and I addicted to Trader Joe’s Cheese Crunchies. * Taken another course on marketing and promo. Not my fav. thing, marketing and promo. I really like doing booksignings and panel talks, but M&P isn’t all chatting with readers. If it were, I’d like it a lot more, because who doesn’t like that? I talk about books with my family and friends a lot. Always have. My mom sister and I will go ten rounds arguing about a book we’ve all just read. * Made my (then) pregnant friend help me redo the back cover copy for both books. It’s amazing what you can get pregnant friends to do for chocolate and air conditioning. 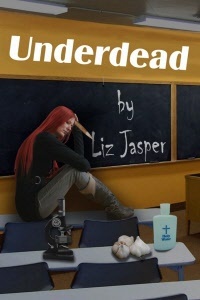 * Started the next Underdead book. * Had a fabulous cover done by the talented husband (Bob McAndrews) of one of my writer buddies. Having a cover that suggested mystery/vampire/humor/fun was a huge plus. Kimberly Van Meter did a great job with the next cover. As ever, thanks Ida Mary Walker, aka mizzd-stock for being the cover model. * Admitted that I had better things to do than learn how to perfectly format a manuscript. Admitted that, as I am not a detail person by nature, perhaps that is one thing I can farm out. Really, really enjoyed making that decision. Steven James Price of Generation Next Publications formatted the print book layouts, the print covers and the ebooks. Great decision to have hired him. That’s a partial list of all the stuff that goes into getting your books back out after you’ve gotten the rights back from your publisher. Now. I have to go check my print book proofs on Amazon. Keep tuned for the official release. No, this wasn’t official. Well, official whining, perhaps. This entry was posted in Book news, Uncategorized and tagged award-winning, book covers, cozy mystery, ebook, EPIC, EPPIE, funny, funny mystery, humor, humorous mystery, indy, liz jasper, liz jasper author, liz jasper writer, mystery, paranormal, paranormal mystery, paranormal romance, print book, re-publishing, re-release, romantic mystery, science teacher, teacher, underdead, underdead in denial, vampire, vampire mystery. Bookmark the permalink.